MS Roald Amundsen is a state-of-the-art vessel featuring new and environmentally sustainable hybrid technology. Not only will this be friendlier to the planet, but it creates a silent cruising experience. Discover wild natural wonders of the Chilean fjords and the spell-binding glaciers of Antarctica, where the wildlife is unafraid of human visitors, and learn to enjoy without disturbing nature. 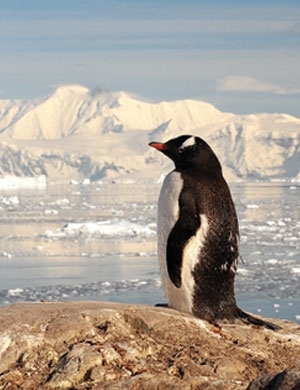 Antarctica is home to millions of penguins, as well as leopard seals and killer whales. Explore the Falkland Islands, taking in the English influences in town as well as on their farms and grazelands. Take advantage of bird-watching opportunities, looking for penguins, caracaras, albatrosses and more. Hurtigruten’s unique heritage and highly-skilled crew enable them to take you across the remote, polar frontier of Antarctica. *All landings are subject to weather and safety conditions. Fares as low as $10,089 and Small Boat Landings, Certified Expedition Teams and More! Small Boat Landings, Certified Expedition Teams and More! Fares shown are per person, double occupancy, in USD ($), cruise only, except where specified and in minimum available category. When flights are included, advertised from price is based on economy-class flights from select gateways, but flights from other gateways and business and premium economy-class seats are available at additional cost. Deviation fee may apply. Changes and/or substitutions are not permitted. Transfers are provided on a group basis and may be by coach or van. There will be no refund for unused package components. Air carrier and flight routing is at the discretion of Hurtigruten. Flights may not be eligible to apply to frequent flyer miles. Electronic documents only. Any advertised packaged fares that include airfare includes all airline fees, surcharges, and government taxes. FREE Air offer includes the following airfare: free roundtrip air, coach class, from New York (JFK), Los Angeles, or Miami to Santiago. (Other gateways are available at an additional cost; please call for details.) Airfare must be booked through Hurtigruten. Guests’ roundtrip air reservation will be placed on hold and booked as soon as airline schedules are available, as early as 330 days prior to the voyage return date. Due to airline schedules, flights may be direct or connecting. This offer includes all transfers between airport, hotel, and pier. This offer includes a one-night pre-cruise hotel stay (where applicable), and a one night post-cruise hotel stay. This offer is not bookable online, please request offer from your travel consultant. This offer cannot be combined with any other promotion except the Ambassador and Child offers. The air portion of this reservation is non-refundable and has no cash value. Full cancellation penalties will apply. Other restrictions may apply. Offer is valid through April 30, 2019. AIR CREDIT Offer: Should you choose not to take advantage of the Free Air Package, you will receive a credit in the amount of $1,000 per person for departures with roundtrip Santiago. For more information, please ask your travel consultant. This offer is valid for new, individual bookings only, for select departures, is capacity controlled, and subject to withdrawal at any time without notice. This offer cannot be combined with any other promotion except the Ambassador and Child offers. Other restrictions may apply. Offer is valid through April 30, 2019. These offers are valid for new, individual bookings only, for select departures, is capacity controlled, and subject to withdrawal at any time without notice. Any zodiac landings scheduled in polar regions are dependent on weather conditions and may change at any time. We reserve the right to correct errors.